1. Some people think Shakespeare was a fraud. 2. Shakespeare introduced almost 3,000 words to the English. Shakespeare has been credited by the Oxford English Dictionary with introducing almost 3,000 words to the English language. Estimations of his vocabulary range from 17,000 to a dizzying 29,000 words - at least double the number of words used by the average conversationalist. 3. We probably don't spell Shakespeare's name correctly. Sources from William Shakespeare's lifetime spell his last name in more than 80 different ways, ranging from "Shappere" to "Shaxberd." In the handful of signatures that have survived, the Bard never spelled his own name "William Shakespeare," using variations or abbreviations such as "Willm Shakp," "Willm Shakspere" and "William Shakspeare" instead. However it's spelled, Shakespeare is thought to derive from the Old English words "schakken" ("to brandish") and "speer" ("spear"), and probably referred to a confrontational or argumentative person. 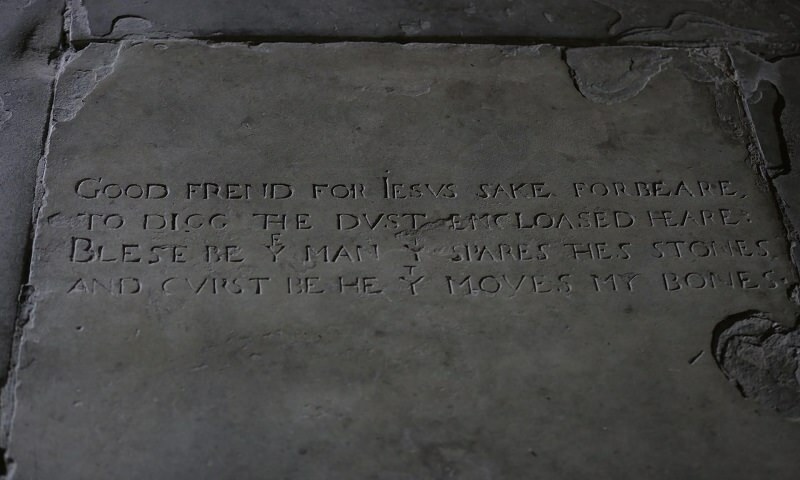 Because Stratford's most famous citizen knew that ordinary parishioners weren't normally granted permanent tenure when they were buried inside the sanctuary, one reason for the writing of this verse incantation was to conjure away a possible eviction. 5. Shakespeare's skull probably stolen by grave robbers, study finds. A story often dismissed as wild fiction, that 18th-century grave robbers stole Shakespeare's skull, appears to be true. 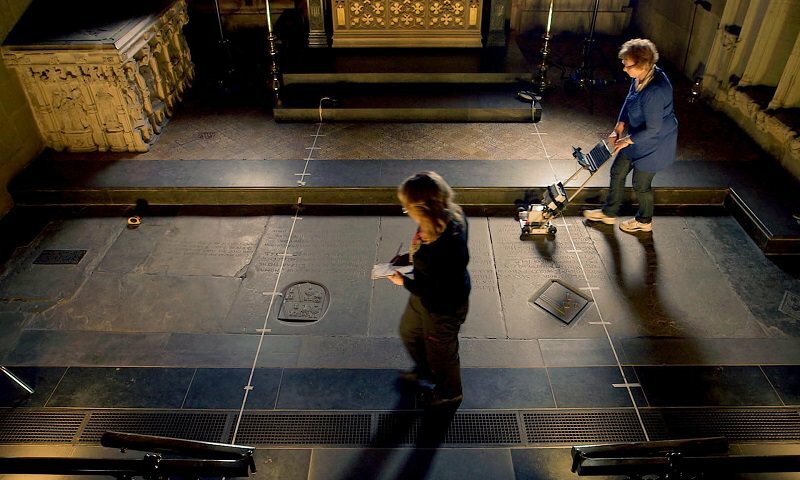 The first archaeological investigation of Shakespeare's grave at Holy Trinity church in Stratford-on-Avon has been carried out for a documentary in 2016. The most striking conclusion is that Shakespeare's head appears to be missing and that the skull was probably stolen from what is a shallow grave by trophy hunters. Grave-robbing was a big thing in the 17th and 18th century. People wanted the skull of famous people so they could potentially analyse it and see what made them a genius. It is no surprise that Shakespeare's remains were a target. 6. Suicide occurs an unlucky thirteen times in Shakespeare's plays. It occurs in Romeo and Juliet where both Romeo and Juliet commit suicide, in Julius Caesar where both Cassius and Brutus die by consensual stabbing, as well as Brutus' wife Portia. Although he showed off his French skills in Henry V, Shakespeare was sparing when it came to the use of Latin. With such diverse audiences, he needed to ensure that everyone could understand what was going on in his plays. Shakespeare use the word honorificabilitudinitatibus in the play Love's Labour's Lost. The Collins English Dictionary definition of the word is "invincible glorious honorableness. It is the ablative plural of the Latin contrived honorificabilitudinitas..."
9. Nobody knows Shakespeare's true birthday. The closest we can come is the date of his baptism on April the 26th, 1564. By tradition and guesswork, William is assumed to have been born three days earlier on April the 23rd, a date now commonly used to celebrate the famous Bard's birthday. 10. Shakespeare's parents were probably illiterate, and his children almost certainly were. Nobody knows for sure, but it's quite likely that John and Mary Shakespeare never learned to read or write, as was often the case for people of their standing during the Elizabethan era. 11. 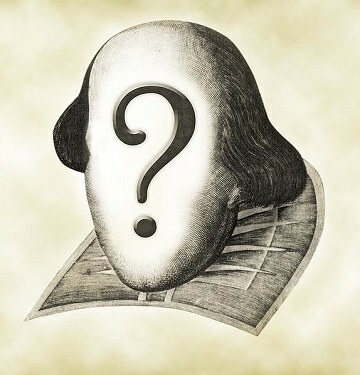 The cause of Shakespeare's death is a mystery. An entry in the diary of John Ward, the vicar of Holy Trinity Church in Stratford (where Shakespeare is buried), tells us that "Shakespeare, Drayton, and Ben Jonson had a merry meeting and it seems drank too hard, for Shakespeare died of a fever there contracted." Ward, a self-proclaimed Shakespeare fan, wrote his diary fifty years after Shakespeare died and most historians agree it appears to be a baseless anecdote. It should be noted though that a serious outbreak of typhus, known as the "new fever", in 1616 (the year Shakespeare died), lends credibility to Ward's story. 12. Shakespeare is also a actor. Few people realize that aside from writing 37 plays and composing 154 sonnets, William was also an actor who performed many of his own plays as well as those of other playwrights (Ben Jonson). 13. Shakespeare is rich during his lifetime. Unlike most famous artists of his time, the Bard did not die in poverty. When he died, his will contained several large holdings of land. 14. Shakespeare married an older woman who was three months pregnant at the time. 15. Nobody knows what Shakespeare did between 1585 and 1592. To the dismay of his biographers, Shakespeare disappears from the historical record between 1585. Historians have speculated that he worked as a schoolteacher, studied law, traveled across continental Europe or joined an acting troupe that was passing through Stratford. 16. Shakespeare had seven siblings. Shakespeare had seven siblings: Joan (b 1558, only lived 2 months); Margaret (b 1562); Gilbert (b 1566); another Joan (b 1569); Anne (b 1571); Richard (b 1574) and Edmund (b 1580). 17. Shakespeare, one of literature's greatest figures, never attended university. Shakespeare would have attended King Edward VI Grammar School in Stratford-upon-Avon from the age of 7 in 1571 and left school and formal education when he was fourteen in 1578. Shakespeare's daily activities after he left school and before he re-emerged as a professional actor in the late 1580s are impossible to trace. Suggestions that he might have worked as a schoolmaster or lawyer or glover with his father and brother, Gilbert, are all plausible. So too is the argument that Shakespeare studied intensely to become a master at his literary craft, and honed his acting skills while traveling and visiting playhouses outside of Stratford. 18. Shakespeare lived through the Black Death. This epidemic that killed over 33,000 in London alone in 1603 when Will was 39, later returned in 1608. By the seventeenth century he had become a famous playwright in London but in his hometown of Stratford, where his wife and children were, and which he visited frequently, he was a well known and highly respected businessman and property owner. 20. It's likely that Shakespeare wore a gold hoop earring in his left ear. Our notion of William Shakespeare's appearance comes from several 17th-century portraits that may or may not have been painted while the Bard himself sat behind the canvas. In one of the most famous depictions, known as the Chandos portrait after its onetime owner, the subject has a full beard, a receding hairline, loosened shirt-ties and a shiny gold hoop dangling from his left ear. Even back in Shakespeare's time, earrings on men were trendy hallmarks of a bohemian lifestyle, as evidenced by images of other Elizabethan artists. The fashion may have been inspired by sailors, who sported a single gold earring to cover funeral costs in case they died at sea.